CHARLOTTE – The machine-gun clicks of the baseline paparazzi sounded like the typewriter clacking of the 1950s newsroom. 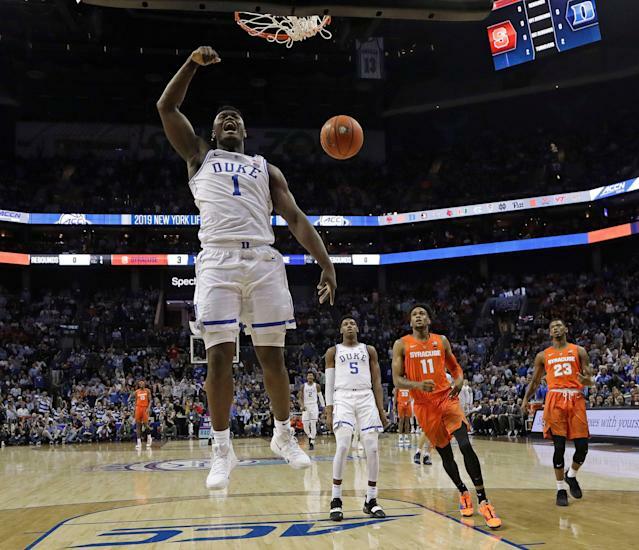 It pierced the collective anticipatory gasp for Zion Williamson in the Spectrum Center at the ACC tournament less than three minutes into the quarterfinals on Thursday night. After Zion forced a Syracuse turnover and took three long dribbles to canvass the distance to the opposite free-throw line, he leapt back into the American consciousness. Williamson catapulted into the air more than 10 feet from the basket and hammed home a tomahawk dunk, eliciting such a visceral spontaneous reaction in the arena that fans of rival North Carolina were caught cheering for him. 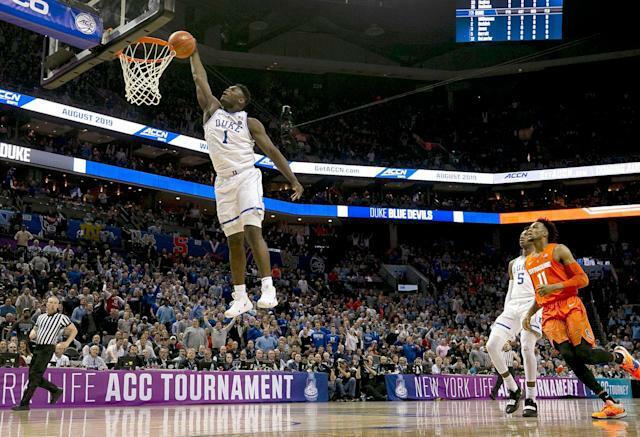 That kickstarted a night that doubled as a reminder highlight montage of all Zion's diverse skills – snatching one-handed rebounds above the rim, dunking a total of five times and wreaking havoc on the defensive end with his deft feet, quick hands and boundless verve. Williamson's return transcends spiked television ratings and Duke's increased chances at winning the NCAA title. There has to be some deep exhales at Nike that their exploding sneaker – which led to his 22-day game absence with a knee sprain – didn't cost Zion more than six games. (Williamson wore a pair of custom-fitted Kyrie Irving Nikes with the Duke logo, a higher cut of sneaker than the Paul George models that exploded on him). Zion reminded us of his greatest quality, delivering energy and joy to the fans, teammates and, really, a sport that desperately needs it. After Duke slumped to a 3-3 record in Williamson's absence from his right knee sprain, Zion cramped the trigger fingers of the baseline photographers Thursday. In the Blue Devils' 84-72 victory against overmatched No. 6 Syracuse, he cannonballed the stat sheet for 14 rebounds, five steals and a block. "He's like the Incredible Hulk," said Syracuse assistant coach Allen Griffin. "You ever seen the movie? Where he jumps up and over people and smashes them. That's what he reminds me of." Amid the fervor of Duke with Zion's return, Syracuse played admirably without leading scorer Tyus Battle, who missed the ACC tournament with a hip bruise. He's expected back for the NCAAs, but the Orange erased a 17-point Duke lead and tied the game in the second half. Orange senior point guard Frank Howard led Syracuse with 28 points but found himself embroiled in a classic modern viral controversy, as his attempt to trip Williamson running down the court blew up on social media. "There's no place in the game for that, it's uncalled for," said ESPN analyst Jay Williams, a former Duke star. Duke fans chanted – "You tripped Zion" – at Howard in the second half as he attempted free throws. The controversy raged more online and television than in reality, as Howard said, "I'm not going to wait four years to get to this stage to start tripping people." His strong showing and Duke's relatively comfortable win is good news for the Blue Devils, who need a good showing here to secure a NCAA tournament No. 1 seed. Williamson did show some lingering conditioning effects from his absence, which is to be expected. That could have contributed to his mediocre night at the free throw line, as he missed five of his first seven and finished 2-for-9. "Couldn't really throw a tennis ball into the ocean with my free throws," Zion said. "So I don't consider that perfect." Duke plays historic rival North Carolina in the semifinal nightcap here on Friday, a game that will be a ratings boon and scalper's dream. It will also feature an intriguing subplot: It looms as Duke's first full game against UNC with Zion. Two of Duke's three losses the last three weeks came to the Tar Heels, as Williamson was injured in the first minute of Duke's home game against North Carolina on Feb. 20. It irked some of the Tar Heels that those victories – emphatic 16- and nine-point wins – were viewed as having an asterisk without Williamson playing. "As much as I hate to see anyone get hurt, injuries are a part of basketball," UNC freshman Nassir Little told Yahoo Sports after Carolina's win over Louisville. "I got hurt in the Virginia game, no one wanted to put an asterisk on that. Duke is a really good team, if we were to play them, whatever happens, happens. I don't think excuses will be made. Injuries are part of the game, it's one of those things we can't control." The Blue Devils weren't exactly running out a rag-tag CYO team without Zion. They have three other players projected to be picked in the first round. On Thursday, Cam Reddish napped through large portions of the game (seven points), but RJ Barrett (23 points) and Tre Jones (eight assists) impacted the game significantly. Still, Zion showed why he's the carbonation that makes the whole roster fizz. There's so much about Williamson that's not quantifiable in dunk GIFs – there's an aura of energy, aggression and physicality that accompanies him to the court. It spreads faster than a cold in coach class, a contagious confidence that Duke desperately needed. That's why there was no doubt around the Duke program Williamson would return, even when his injury prompted a referendum on amateurism. "There was no question about it," he said. "I knew I was going to be back." With Syracuse hanging around midway through the second half, Williamson tipped out an offensive rebound that led to a Duke trip to the free throw line. It was just one of countless examples – altered shots, clogged passing lanes, intimidated shooters – of the ways Zion impacts beyond the box score. Williamson is the sure-fire No. 1 pick in the NBA draft. There's still a bit of a boom-or-bust feel to his future, especially if he doesn't refine his jump shot and become a 3-point threat (29.2 percent). But the allure of what he could evolve into will be irresistible, as he's already established himself as the most celebrated prospect in the American basketball system since LeBron James. Zion has 2.6 million Twitter followers, which, to put in perspective, is five times the amount of Zion National Park. Zion has already entered the one-named nomenclature of pop culture, like Pelé, Madonna or Kobe. And Thursday night was a tour-de-force, wire-to-wire, end-to-end reminder of why. "I've been in this game over 50 years," Syracuse coach Jim Boeheim said. "I've seen a lot of great players, I'm not saying he's better than those guys, but he's a different player. He can do things that nobody has done in this game." Perhaps the best way to sum up the feeling he elicits: The dominant buzz after his epic performance was giddy anticipation of the next one. That'll be Friday night against UNC, and the sports world will be watching and waiting again to see what Zion does next.